Clorofille wishes to promote green living and sustainability and nature is the most obvious place to have fun and to spend time with your family. That is why we organize workshops and events where you can learn how to make 100% additive free vegetable colors together with your kids. Or you can try our course on how to make everything you need for a great spa experience. Nature’s possibilities are endless and by becoming an urban gardener yourself, you can take advantage of it even if you live in the middle of a big city. All you need is a balcony, a patio or even just a small windowsill. Did you know that urban gardening is not just sustainable in the sense that you get an outcome in the form of flowers, herbs, or vegetables? It is also sustainable because you can use a lot of otherwise useless byproducts from your daily household. For instance, used coffee grounds make an exceptional fertilizer! Instead of throwing it away you can use it to maximize your outcome when you grow stuff. All you have to do is to sprinkle it around your plants and then water them as usual. The coffee grounds contain nitrogen and your plants will love this! 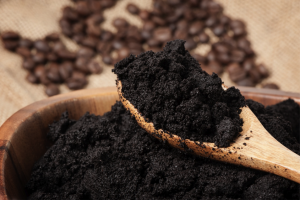 Another plus about using coffee grounds is that the scent is said to keep insects and other pests away. Also, if you’re growing plants that require a high level of humidity, the coffee grounds will ensure that mold and mildew cannot thrive and this makes it both healthier and easier for you to ensure perfect growing conditions. If you are not a coffee drinker and you do not have access to coffee grounds on a regular basis, there is another neat trick that you should know. 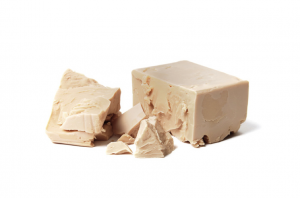 We all know it; you have bought a package of yeast, used some of it and then put the rest back in the refrigerator. Before long you will have forgot all about it, and the next time you come across it, it has gone hard and turned brown. Instead of throwing it away you can also use this as a fertilizer! Simply dissolve the leftover yeast in some water. One standard pack should be enough for three liters of 100 % edible fertilizer. As with most fertilizers, don’t overdo it – once every month should be plenty. This trick is exceptional for growing vegetables and ensuring a good outcome. 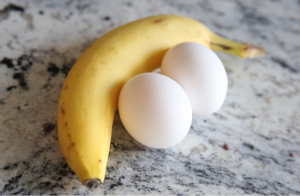 When you plant for instance a tomato plant or pumpkins for autumn, simply place a banana and an egg in the hole you have just dug, cover it with some soil and then place the plant. This will ensure that your plant gets the right amount of nutrition over a long period of time, and it will make a big difference come harvest time! Or you can mash up the banana peel and mix it with some eggshells. This will work just as well and has one major advantage. If you use lots of eggshells and make sure that the pieces are not too small they will act as little “knives” and keep away snails and other creepy crawlers. These are all examples of things you would have otherwise thrown out, and essentially, they are free. They are sure to boost your garden tremendously, and they provide a perfect way of utilizing everything and avoid any unnecessary waste. That is sustainability for you! Did you know that by growing herbs and vegetables yourself, you are also minimizing food waste? If you grow things yourself, you are less likely to throw anything away because of the time and effort you have invested in the outcome. Unlike going to the supermarket, this takes time. But it is well worth it – the taste is so much better! Also, you can grow things together with your kids and this is sure to guarantee that they will not be fussy when it comes to vegetables. No child will pass up the chance of picking for instance a tomato or a cucumber from his or her own plant and eat it. Clorofille offers a nice range of readymade kits to grow your own flowers and herbs. Before long we will be adding kits for growing vegetables as well! 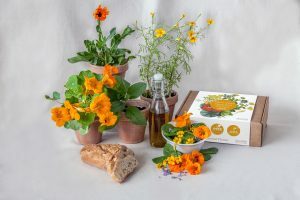 Until then you can for instance try our “Grow your Gourmet Flower” kit which allows you to grow delicious edible flowers that will add a creative and colorful touch to your dishes. You can also check out our workshops and events on our website or on our Facebook site.